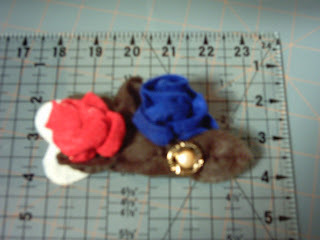 starting to learn how to make milinary roses. These are felt as I don't have the money to waste on making practice work with silk or leather right now. My camera skills as usual are awful. The DH is going to have to take a new set of pictures for me. Lovely roses, perfect for...a hat contest! Support a public library with Hat's off to libraries! Send 2 photos of your hat with name and address on the back, a statement indicating the materials used and that your hat is an original creation or altered from a purchased state and a non refundable $10.00 entry fee, made payable to Saxton B. Little Library. 1st prize - an autographed copy of Tim Gunn's new book, 2nd prize a hat to alter or wear and 3rd prize a gift cert. to Joann's fabrics. We look forward to seeing your hat!